Each year, about 50,000 people are injured and nearly 2,000 are killed in motorcycle accidents in the United States. Motorcycle riders in accidents involving other vehicles have a 98% chance of sustaining an injury. And while most motorcycle riders could not have avoided this type of auto accident with another vehicle, in most cases the driver of the other vehicle involved could have! A motorcycle accident is likely to result in catastrophic injury or death for the motorcycle rider because of the size of the bike and the lack of protection. If you are a motorcycle rider who has been injured in an accident caused by someone else’s negligence, then you deserve maximum compensation for your injuries. For a free case evaluation, please call our experienced South Carolina accident attorneys at 888-353-5513. There are many causes of motorcycle accidents, some caused by other drivers and some caused by environmental factors. Motorcycles are smaller and lighter than other vehicles. This makes them harder to see, and more susceptible to defective roadways and spills, on which they can easily lose control. Accidents can also be caused by riding on poorly-maintained roads, especially when it is raining or in high winds. In certain cases, the accident may have been caused by a defective design or motorcycle part, which could become the basis of a defective product case. When a motorcycle is struck by another vehicle at high speed, the driver of the motorcycle is likely to suffer some serious injuries. Without the protective enclosures and safety features of cars, motorcycles can cause much more serious injuries to their drivers. Safety equipment can mitigate the damage caused by a motorcycle crash, but it will not eliminate it entirely. Because Motorcycles are much lighter than other vehicles and offer no protection, whereas passenger vehicles have seatbelts and crash-rated protective cabins, car drivers may be found to have an additional responsibility to look out for motorcycle drivers. These are serious consequences, and McWhirter, Bellinger & Associates’ experienced motorcycle accident attorneys understand how a single crash can devastate the lives of you and your family members. We have handled many accident cases involving various types of vehicles. We know how to investigate the details of your case to determine the cause. If the cause of your accident came about because of someone else’s negligence such as a careless driver or a defective design, then we can aggressively pursue compensation on your behalf. What if I Wasn’t Wearing a Helmet? 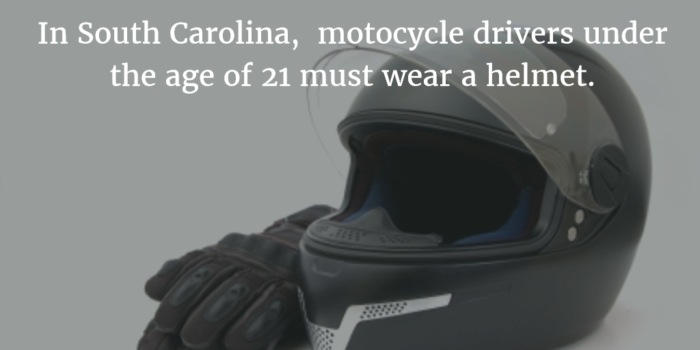 Helmet laws in South Carolina are fairly relaxed: only drivers age 20 and younger are required to wear helmets when riding a motorcycle. Obviously, not wearing a helmet can result in relatively more serious injuries. But if you failed to wear your helmet, you should still be able to recover damages if the other driver was at fault for your accident. As long as the motorcycle accident was caused by another driver’s negligence, you can still bring forward a claim. If we can determine that wearing a helmet would not have made a significant difference in your injuries (e.g., if your spinal cord was injured), then it will probably not make a difference in the outcome of your case. However, your failure to protect yourself with a helmet may influence the total amount of compensation you receive. If you sue the other driver for damages, a judge may reduce the amount you recover proportionately to how much your injuries were aggravated by your failure to wear a helmet. Even if the accident was not your fault, the court may decide that your decision contributed to your injuries, and your are therefore responsible for some of the costs. Motorcycle accident cases can be complex. In some cases, you may be able to recover damages from another driver at fault for causing your injuries, even if you do not carry insurance coverage. You may also be able to recover damages if another vehicle caused you to veer off course without actually colliding with you. It is important, however, that you consult with a personal injury attorney with successful experience in motorcycle accident cases. When another person causes you to have an accident, it creates extra costs that put a financial burden on you and your family. A lawsuit against the responsible party shifts this burden to the person who caused the accident in the first place, so you don’t have to suffer unjustly as the result of another’s actions. “Damages” refer to the total financial costs for which the person you are suing is responsible. The amount of damages for each of these categories can also vary from person to person and case to case. Some of this comes down to your personal characteristics—for example, if you were near retirement, you’re not going to get as much for lost future earning capacity as someone just starting out his career—and some comes down to how persuasively your lawyer can argue your case. Many motorcycle accidents end in death. If you lost a parent or a spouse in a motorcycle accident, you may have grounds to file a wrongful death lawsuit. This takes many of the same things into account that a motorcycle accident lawsuit would. The difference is that the court is trying to put a number on the losses that your family suffered as a result of the death. Our experienced auto accident lawyers will carefully investigate your loved one’s accident to gather the evidence you need to pursue a successful case. After your accident, it’s likely that you’ll end up dealing with an insurance company, either your own or the other driver’s. South Carolina is a “fault” state, meaning that the other driver’s insurance will have to pay for your damages if they are found to be more than 50% at fault for the accident. However, insurance companies will try to avoid paying if they can help it, and may try to deflect blame onto you. This is a situation where having an experienced motorcycle accident lawyer can come in handy. If you accept an initial settlement from the other driver’s insurance company, you may be unintentionally releasing the other driver from full liability for your accident. The problem with settling fast is that the full extent of your injuries may not be apparent for weeks. In addition to this, many motorcycle accident victims are not sure when they will be able to return to work. Until this can be determined, the true value of your injury claim will remain unknown. It is always in your best interest to consult with an experienced motorcycle accident lawyer before accepting any type of settlement from an insurance company. The great appeal of motorcycles is the freedom of the open road, but this freedom can come at a cost. Motorcycle crashes are known for causing severe injury to the motorcycle driver, who often needs assistance for a long time afterwards. It is important, therefore, that you consult with a personal injury attorney with successful experience in motorcycle accident cases. The law firm of McWhirter, Bellinger & Associates has many such lawyers. 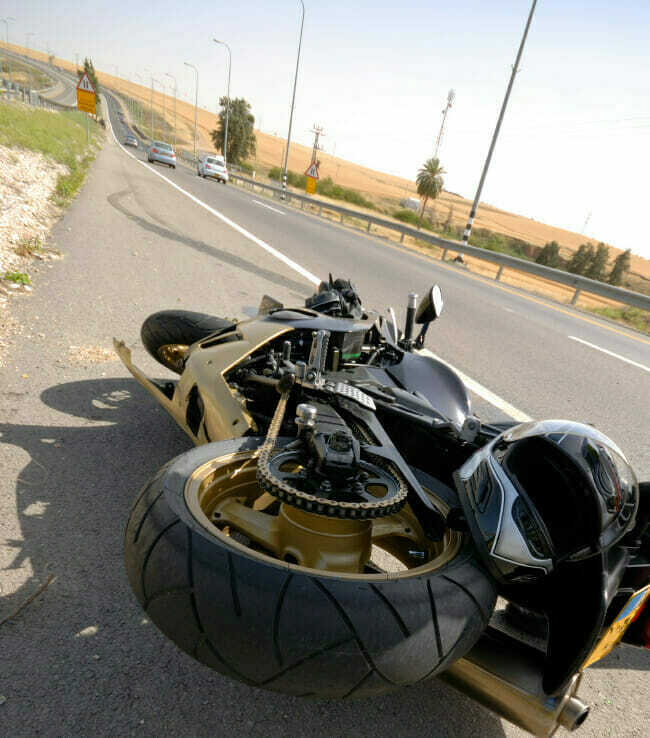 Our motorcycle accident attorneys know how to work with accident reconstruction experts, and we’re familiar with issues pertaining specifically to motorcyclists and motorcycle accidents. McWhirter, Bellinger & Associates serves the residents of South Carolina, with locations in Columbia, Lexington, Sumter, Aiken, Orangeburg, Newberry, and Camden. Please call 888-353-5513 or email our motorcycle accident lawyers in SC here at the law firm of McWhirter, Bellinger & Associates, P.A., for your free case evaluation.